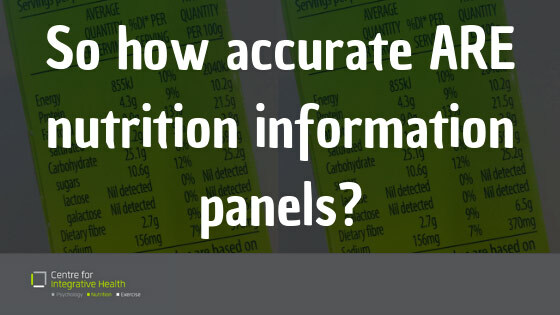 How accurate are nutrition information panels? Diet-culture loves numbers, and within this culture of nutritional-micromanagement, we’re sold the idea that we can achieve tight and calculated control over food and our bodies through counting, tracking, weighing and measuring. The truth is, the numbers we’ve been conditioned to place so much trust in can be pretty inaccurate. In Australia, companies are required to put a Nutrition Information Panel on any packaged product and the law states that they must not be misleading. However, there have been few scientific studies that have evaluated actual compliance with these laws. One of the few that have identified that on average, food products contained anywhere from 13% less to 61% more energy or nutrient than what was stated on the packet. Due to seasonal, processing and packaging variation, the margin of error can also vary from packet-to-packet within the same product and brand. In addition, there are actually no laws in Australia that provide an upper limit for allowable error in nutrition labelling. What’s more, the apps and calculators people use to try and micro-manage their intake (eg MyFitnessPal) are crowd-sourced, meaning they’re about as trustworthy as Wikipedia. And, as food formulations vary from country-to-country, the composition of the American or European version of some foods will be quite different to what you are eating in Australia. Combine all of those margins of error and you’ll find that diet-culture has sent you on a wild goose chase trying to maintain maximal control over something that you simply cannot. Sure, we can use nutrition science and our understanding of physiology to guide our intuition towards improving our health and satisfying our needs, but it’s time we blew the lid off the misguided view that we’re in control what we eat down to the single kilojoule or gram. This post may cause distress or discomfort for some, and we encourage you to discuss the topic with your psychologist, or another member of your treating team if needed. The Butterfly Foundation also has a helpline (1800 ED HOPE) or webchat available if you would like someone to talk to. ← CFIH Dietitians’ top 5 diet myths BUSTED!